The language of lenses has become simplified in recent years but, although the comparison between achromatic and apochromatic lenses is rarely discussed, the term apochromatic is one that has survived. Often abbreviated to “apo”, the term apochromatic refers to the extent to which the lens is colour-corrected to address a particular problem. The problem concerned is longitudinal chromatic aberration, which is different from the oft-cited “chromatic aberration” that is in fact lateral chromatic aberration. The longitudinal form most often affects long focal-length lenses (which is why apochromatic specifications are most likely to be found in telephoto lenses) whereas the lateral form most often affects short focal-length lenses. In terms of visual effect, lateral chromatic aberration is seen off-axis (towards the corners of the picture) and results in coloured fringes whereas the problem that apochromatic lenses address (longitudinal chromatic aberration) arises from the fact that different wavelengths of light are brought to a focus at different distances from the lens. Longitudinal chromatic aberration can be seen even in the middle of the picture and most commonly results in a general loss of sharpness but may also manifest itself in the creation of coloured haloes. Apochromatic lenses therefore tend to produce better sharpness and improved colour rendering. The cause of the problem can be traced to the fact that white light is dispersed within a lens, meaning that red, green and blue rays of light all travel by very slightly different paths while they are inside the glass. When the emerge they are projected at slightly different angles, resulting in the blue light being focussed closest to the lens and the red light being focussed farthest away: green light is focussed in between (see below). Diagram showing the different focal points for blue, green and red light. The distance of the blue and red rays away from the green ray at the point of focus indicates the haloes that are likely to be seen. Clearly the green and blue light come to a focus at a very similar distance in this case whereas the red light come to a focus comfortable behind the other rays and will create a reddish halo around blue/green focussed points. This diagram is of an achromatic-type lens. Illustration (c) Jon Tarrant. This effect happens with all lenses, so why are apochromatic designs confined mostly to lenses with longer focal lengths? 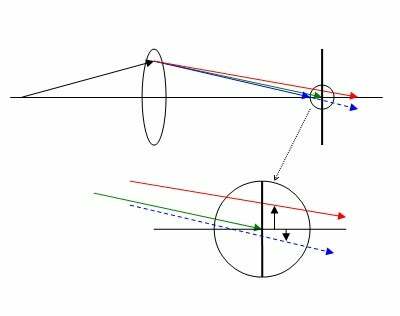 The simple answer is that whatever the percentage difference between the path of the blue and red rays may be, it will always result in a bigger focussed-distance difference for a greater nominal focal-length. The bigger the focussed-distance difference there is, the larger will be the unfocussed spot of, say, red light at the point where the blue light is brought into focus. So you would expect, in a severe case, to see a redder halo around a bluer spot when white light is focussed using a non-apochromatic lens. Apochromatic lenses can work either by minimising dispersion in the first place or by balancing the dispersion caused by one element against negative dispersion introduced by another element. And that is where the “achromat” part of this explanation appears, for the trick of cancelling out positive and negative dispersion is exactly what achromatic doublet lenses of old set out to achieve. Adding a third element can provide even greater control of longitudinal chromatic aberration and achieve apochromatic correction. For the record, although apochromatic lenses can be fully corrected for longitudinal chromatic aberration in the visible spectrum there are also superachromatic lenses that are corrected for both the visible spectrum and invisible IR radiation. Unsurprisingly, given that it was Ernst Abbe at Carl Zeiss who proposed the first achromatic and apochromatic lenses, the first lens to achieve superachromat specification also came from the Zeiss stable and was the Sonnar-Superachromat 250mm f/5.6 CFE for medium-format cameras. According to Zeiss, the Superachromat 250mm f/5.6 CFE is “the finest photo lens ever conceived and brought to reality”. I would not dream of contradicting so high an authority but I would add that such quality does not come cheap and if you need to ask the price then you probably won’t like the reply!